It’s been awhile since I last discussed GRx Moon, one of my darling archetypes. Sarkhan, Fireblood inspired me to return to the deck for the first time since the Bloodbraid Elf unban, itself an episode that ended up frustrating me as I tried and failed to integrate the hasty 3/2 into the deck. M19’s new planeswalker seems to tie all the pieces together. Today, I’ll unveil and explain my newest build of GR Moon. Between hyperbolic endorsements as “Brainstorm” and continued success in aggro-control strategies as diverse as Mardu Pyromancer and Grixis Shadow, Faithless Looting has fully caught on in Modern. Looting has always been at the center of GRx Moon, a deck I developed while working on Skred Red in 2012 after splashing green for Tarmogoyf in that shell. Here, it transforms excess mana sources and lock pieces into more business or otherwise fixes early draws, all while growing Tarmogoyf. The card also represents the key divide between GRx Moon and GR Ponza, the Inferno Titan-toting land destruction deck that rose to prominence a couple years ago. While that deck continues making land drops to cast its pricey bombs, we accommodate Looting by willfully giving up mana sources beyond the fourth, instead relying on an incidentally huge Goyf to apply late-game pressure. We don’t spend early turns setting up our mana; we spend it interacting and putting opponents on a clock. Elephant in the room: for all the years I’ve played around with GRx Moon shells, Bloodbraid Elf has not been Modern-legal. But it slots right into our curve by coming down after three-mana play, and clearly plays roles this deck seeks to fill. Some of those roles include quickly applying pressure (haste), sifting through excess mana sources (cascade), and out-spelling our opponents (also cascade). What’s awkward about Elf is that it occupies the same slot in the curve as Huntmaster of the Fells, historically a powerhouse for us. The plan has long been to supplement Huntmaster with another threat and call it a day. But jamming Elves there doesn’t actually work, since with Huntmaster as our other premier non-Goyf threat, our cascades are simply too mediocre on average to justify playing Elf at all. Besides, the sudden aggression Elf provides doesn’t mesh so well with Huntmaster’s preference for resource-strapped grinding. The solution? Cutting Huntmaster entirely. I’ve filled his shoes with Goblin Rabblemaster, a high-impact cascade hit in line with Bloodbraid’s bottom line. 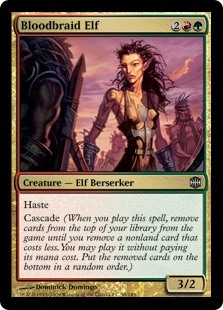 And joining Bloodbraid at the four-mana slot is Hazoret the Fervent, another curve-topper adept at closing out games. Hazoret mitigates our feel-bad Lootings and proves troublesome for certain decks to remove. Its reach ability tends to deal around four damage, too, so the card often translates as half our opponent’s life total. Bloodbraid, Rabblemaster, and Hazoret all share the same philosophy: get opponents dead fast after tripping them up with a Blood Moon. GRx Moon would play more than 4 Faithless Looting if given the chance, and I’ve tried quenching the deck’s thirst for worthwhile discard outlets with candidates as diverse as Liliana of the Veil and Collective Brutality. 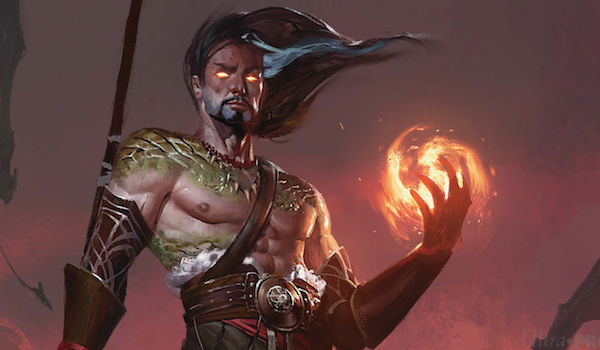 Sarkhan, Fireblood is an exciting addition to Modern from M19 that may serve up the extra Lootings we crave. Sarkhan may lack the sorcery’s brute efficiency, but he does boast several benefits. For one, Sarkhan’s a planeswalker, a card type Tarmogoyf has desperately wanted since I began this project. I’ve tried Nahiri, the Harbinger, Chandra, Torch of Defiance, and Chandra, Pyromaster in this deck, but none quite cut it—four mana’s a steep price to pay for a walker in Modern, as we know from Jace, the Mind Sculptor‘s relative failure post-unban. At three mana, Sarkhan comes down on turn two off Hierarch or Sprawl to start digging through the deck. While digging, Sarkhan also pressures opponents from a unique angle: by steadily ticking up to an ultimate that’s difficult for most decks to interact with. Four 5/5 Dragons is like Marit Lage Plus in a format so reliant on Path to Exile. After an activation or two, and especially on an empty board, opponents must start dedicating resources to getting Sarkhan off the table, which lets us happily continue looting and take games the old-fashioned way. Finally, Sarkhan’s an excellent cascade hit, and a fine play against opponents clutching a grip full of removal. Its inclusion also gives us enough reliable discard outlets to accommodate a pair of Darksteel Citadels (this time without the hit-or-miss Boom // Bust), which are basically free Goyf pumps in a deck with such good mana. I went with the classic 4-4 dork/sprawl split in this list. Sprawl is tougher to interact with, and so a safer bet when it comes to slamming fast lock pieces. But dorks are preferable in many instances, too; for a big Sprawl turn, wherein the enchantment acts as a sort of Springleaf Drum by breaking even on mana while ramping us, or to walk opponents into an angry Tarmogoyf. Running both card types gives us more choice regarding how to play out our openers and adds depth to our mulligan decisions. Despite this build’s demanding RR requirements for Sarkhan, Fireblood, Anger of the Gods, and Molten Rain, I went with Noble Hierarch over Birds of Paradise. Exalted is just too important with our threats. It helps us win Goyf wars, of course, but also significantly enhances Goblin Rabblemaster and Bloodbraid Elf. Not to mention Hazoret hits like a ton of bricks with Hierarch in play. 4 Blood Moon is a given, so let’s talk about Magus of the Moon, which I include in my GRx Moon decks at 0-2 copies. This card’s worth shifts with both the metagame and the build of its home deck—both cases thanks to the existence of Lightning Bolt. With more opponents on Bolt, Magus becomes worse, as it does in a shell light on mana dorks. Dorks power Magus out right away if opponents demonstrate no kill spell by not shooting our accelerant, and they also draw fire away from the pricey Magus, which otherwise can cost us some tempo. Our removal package is very straightforward: 4 Lightning Bolt, 2 Tarfire. The purpose of these spells is to clean up early threats from opponents and mana dorks before we land Blood Moon or otherwise put the game away. Between Elf, Rabblemaster, and Hazoret, this build is significantly more aggressive than previous iterations of GRx Moon; as such, our need for heavy-duty removal decreases. The best late-game plan is to never enter the late-game! I experimented with varying amounts of Dismembers in the mainboard and eventually settled on 0. Much as I love the card, Dismember only sometimes snipes enemy Goyfs, and is a hit-or-miss cascade in the dark. It’s painless to Loot away, though, and helpful in certain matchups (chiefly Eldrazi), so I kept one in the sideboard. 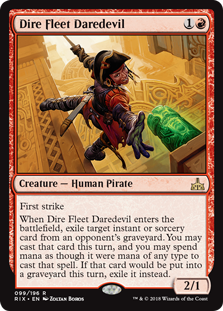 4 Dire Fleet Daredevil: The other big addition to GRx Moon is Dire Fleet Daredevil. This card comes in against all spell-based fair decks, which mostly means blue control (Jeskai) and black midrange (Shadow, Mardu). Its original purpose here, though, was to answer enemy Goyfs, something my “Turbogoyf” decks have always struggled with to some degree. I realized in testing that the Goyf decks currently in Modern are also Fatal Push decks, and ones that struggle against specifically Snapcaster Mage. Daredevil turns their Pushes on their own Goyfs while plussing in a way difficult for them to answer cleanly. The only problem with this plan is that Daredevil needs a Push to eat before opponents start beating us up with their Goyfs. Hierarch and Tarmogoyf are critical at baiting out the removal spell, but especially the latter; should opponents miss on removal, our Goyf will handily hold down theirs until a stall-breaker arrives, and can even go on the offensive with some help from Hierarch or a burn spell. 3 Molten Rain: Our Stone Rain analogue, Molten gets the nod mostly because we can support it. It’s also a superior cascade hit and supports our reach plan. 3 Ancient Grudge: The most effective artifact spot removal in Modern. Tripling up on Grudge is quite easy to do at this stage in the deckbuilding process, and makes our artifact matchups a breeze. 2 Anger of the Gods: Gets the nod over Pyroclasm for the extra damage and exile clause. We need to be able to cleanly deal with gummy Collected Company boards, or Tarmogoyf loses a lot of value. The last point matters against Humans. I’ve also found Anger invaluable for the Krark-Clan Ironworks matchup; if we keep them off their namesake card, they chump Goyf eternally with Scrap Trawlers and Myr Retrievers, a plan Anger halts. 1 Dismember: All-purpose removal for every creature matchup. 2 Surgical Extraction: I tried a black splash early on to address enemy Tarmogoyfs, and now dearly miss Nihil Spellbomb in this build. But Surgical’s still plenty strong in Modern, especially in the hands of a skilled pilot. While an unexciting cascade hit, Surgical in the hand protects us from all kinds of enemy shenanigans, and the card has over-performed relative to my expectations so far. So far, I’ve noticed multitude of differences between this and other builds of GRx Moon: we gain consistency in the mid-game, but suffer more if we lose our accelerant right away; we’re softer to go-wide aggro decks, but better against everything else. Adding dorks is the first agenda point to try. I’ll have to test a good deal more before making any major tweaks, but am stoked with Sarkhan so far, and encourage naysayers to try him out—other shells I think would benefit from the walker are Skred Red and Mono-Red Prison. Happy digging, everyone! Domri has always been awful in this deck. Have tried him a few times. 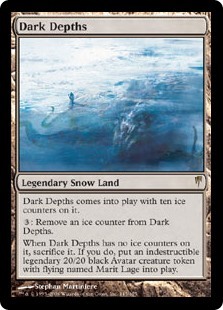 Creature count always too low for the plus to matter, and we want to dig into our answers; fight mode sometimes fine but highly matchup- and board-dependant; ultimate doesn’t win the game on its own and is therefore mostly useless.